The Community College of Baltimore County’s multipronged approach and collaborations reduce its carbon footprint, while realizing cost savings. Since beginning in 2008 its journey toward a sustainable future, the Community College of Baltimore County has formed three partnerships that save money, as well as energy. CCBC was recently honored with a NACUBO 2016 Innovation Award for this coordinated approach to lowering emissions, as well as expenses. With the 5.7-megawatt system, Hopp estimates that the institution is currently saving $100,000 a year on the amount of kilowatts consumed and the savings will grow over time. CCBC has also installed 20 electric vehicle–charging stations that are powered by the panels and available to the college community. In an interview with Business Officer, Hopp describes the institution’s sustainability efforts. Solar panels that cover parking lots across the Community College of Baltimore County’s three campuses, generate about 27 percent of the institution’s annual electrical load. What made you decide to pursue solar power? CCBC is working to reduce its carbon footprint and improve its environmental sustainability. We looked at solar energy five years ago, and the cost per kilowatt was significantly more than power from brown energy (energy from polluting fuels and fossil fuels). We continued to watch the market, and three things happened. First, the cost of solar panels has continued to decrease to such an extent that it is now economically viable in many parts of the country to obtain solar power more cheaply than brown energy. Second, CCBC entered a period when money was tight, and we were looking for ways to save money. Third, we found a very good partner in Constellation, which, after a merger with Exelon Corp., had committed to installing a large amount of solar power in Maryland on a very aggressive timeline. It sounds like the stars aligned. Yes. The company, which had this responsibility to install solar, was cold-calling customers. I was fortunate that our executive director of facilities management was attuned to the opportunity. We checked with other solar power vendors for a comparison, and based on that competitive process, we were able to negotiate a very advantageous contract. What does your contract entail? 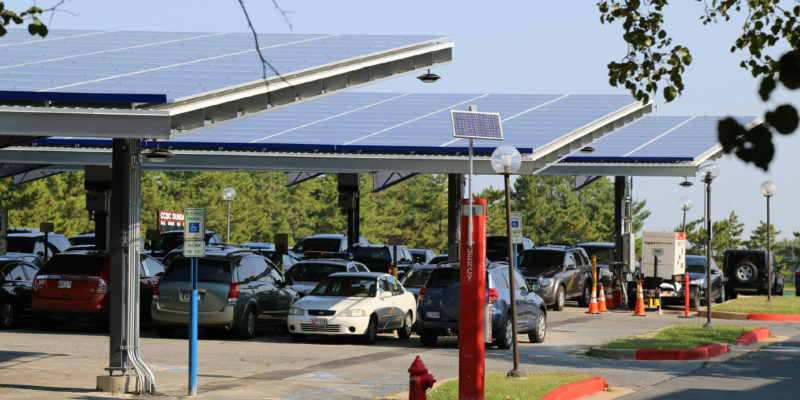 Our solar power purchase agreement stipulates that Constellation is responsible for the engineering, purchase, and installation of the solar carports—a multimillion-dollar expense. CCBC agreed to buy—for 20 years at a specified price—the amount of energy equivalent to what these solar panels produced, which is about 1.2 pennies a kilowatt less than what we were paying. We negotiated a no-escalator clause, meaning what we pay for energy today will be the same in year 20. How are you monitoring the program? Our purchase agreement includes guarantees about the amount of electricity that will come from the panels. We have a public, Web-based dashboard that shows how much energy we are producing by campus at the moment, in the last week, in the last month, and since inception. I can track the energy, the averages, and expectations. I can also track the social benefit of this amount of power. For example, by using solar power, we saved 6.1 million pounds of carbon dioxide in the first eight months of operation. Having large solar canopies on our campuses is a very noticeable feature. To make sure that people were onboard, we discussed with the college community the panels’ appearance and how that would alter the look of the campuses. It turns out that people were not unhappy at all about the aesthetics. In fact, they were delighted that our commitment to sustainability is [so visibly] front and center. You can’t come on campus without thinking that CCBC is a forward-looking, responsible citizen. What about other potential issues? We have regular construction challenges. We need our parking lots. Coordinating the construction was a bit of a challenge, since we operate the college year-round. Construction began the week after graduation, and all the heavy work finished before classes started at the end of August, although we did some night work in September. Everything went live in October 2015. It was a compressed timeline. One Sunday, as we were nearing the deadline, I must have seen 50 electricians working on the panels. They pushed hard. Tell us about your other partnerships. The Constellation partnership is all about the supply side. Our other two partnerships are on the demand side. EnerNOC is an energy consortium that supplies us with a certain amount of green energy—about 10 percent—but 90 percent is brown energy or fossil fuel energy. In 2013, when we were feeling pressure on the financial side, we talked to our EnerNOC representative about ways to reduce our costs. We were offered participation in its demand-response program, under which we promised to curtail our energy usage when the grid calls an energy emergency. What constitutes an energy emergency? Suppose we have a series of very hot days in a row, and the power grid can’t support all the demand. As a big user, we agreed to curtail our energy in that event. For participating in the program, we qualify for an annual incentive payment. In our first year, we got an $180,000 payment for participating. This year, it was a little more than $55,000—just to participate. If an actual energy event is called, we get an additional payment. What’s your other demand-side partnership? The Smart Energy Savers Program with BGE. By installing more energy-efficient fixtures, we were able to submit for a smart savers rebate. Our installations have ranged from new boilers, to LED lighting in the gymnasium, to exterior walkway lights. For us, it’s added up to about $340,000 over the last five years. Many utility companies offer similar programs. What advice do you have for other institutions interested in reducing their energy consumption? Investigate solar energy. The numbers have changed—and not only for the cost of installation and production. There are now solar tax credits, which vary by state, that make it attractive for vendors to join you. For years, the standard response was, “Yes, you can be green, but it will cost more.” That’s no longer true. 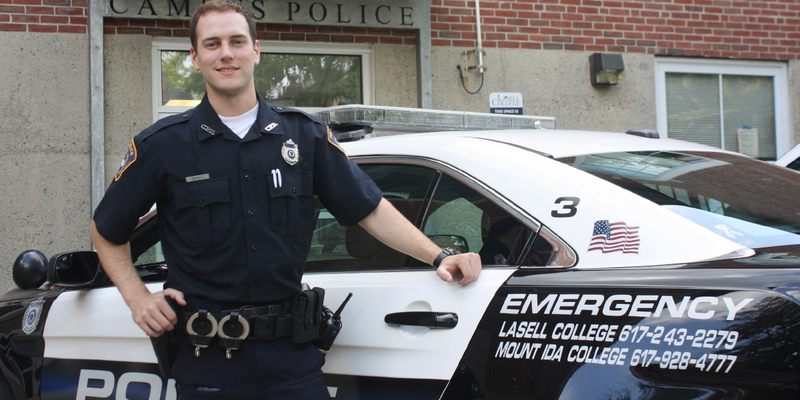 Lasell College and Mount Ida College have a partnership to share campus police functions. Three efforts, embarked on with competing institutions, help Lasell College achieve significant savings, process improvement, and resource enhancement, while strengthening its connection to the surrounding region. Collaboration is the wave of the future and an important ingredient in the toolkit of every CFO, particularly those who work in small to midsize institutions, insists Michael Hoyle, vice president of administration and finance, and CFO, Lasell College, Newton, Mass. Lasell was recently honored with a NACUBO 2016 Innovation Award for its multiple collaborations with surrounding institutions. Such efforts led to significant savings, process improvement, and resource enhancement, while greatly improving community relations. Hoyle, who has made collaboration his mantra, has come up with three creative partnerships: (1) on campus police functions with Mount Ida College, Newton; (2) information technology with Pine Manor College, Chestnut Hill, Mass. ; and (3) employee health insurance with 12 colleges. In an interview with Business Officer, Hoyle describes the institution’s collaborative efforts. What’s the value of collaboration? I can see how really large universities with 20,000 to 30,000 students would wonder, “Why bother?” For small- and medium-sized institutions, this model increases the economy of scale. Instead of an institution of 2,000 trying to purchase or perform a service, now we’re talking about a group of 5,000 to 10,000, depending on how many colleges are involved. At that scale, you can start to play on the same field as the big universities, whether public or private. It’s a matter of keeping costs down and improving quality. What prompted your partnership with Mount Ida College? We explored it and then widened the conversation to other senior leaders on campus, who were open to the concept and willing to see how it would work. Both institutions share the cost of top-level administrators, including the chief of police, the office manager, and a 24/7 dispatch center with six dispatchers. By sharing costs, we were able to increase our patrol coverage and create a detective position, which we always wanted but [for which we] couldn’t justify the cost. In the case of a major incident on either campus, we have a larger force to draw from. Our force, which has almost doubled in size, allows us to build in career ladders, mentors, and a depth of professional expertise. What if both institutions require assistance at the same time? We try to coordinate our calendars for all-hands-on-deck activities, such as opening day, commencement, and athletics events. Clearly, the chief has to answer to both institutions, putting more of a burden on him in managing and navigating communications channels. Although close in geography and size, both institutions have different styles, cultures, and ways of thinking about student discipline. Police must realize and remember that how they handle a particular incident depends on which campus they are on. Plus, everybody has to be mindful that two institutions are involved in this function. At budget and reporting time, we can’t just talk to our own folks. A lot of communication between campuses has to happen. Who’s in charge of hiring and firing? The chief. And, the chief reports to the vice president/special assistant, who reports to the president at Lasell. Technically, the police staff are all Lasell employees. When we were conceiving this, we already had a professional campus police force with arrest powers who could carry weapons. Rather than require Mount Ida to get the various state licenses and designations, it was quicker and easier for us to do this under Lasell’s banner. However, the cars and uniforms all say Lasell/Mount Ida. It’s very clear it’s a joint force. How do you divide the costs? We share 50/50 the costs of the chief, dispatcher, office manager, and common support roles. The number of officers and command staff at each office are borne 100 percent by their designated campuses. If one institution wants to have more coverage on certain nights than the other, it bears that cost. How does Lasell benefit from the partnership with Pine Manor on IT? When you collaborate with another institution, you can slow down the increase in IT costs, because you can share them [administrative and network costs]. For Lasell, it’s been budget relieving in that way. It also makes us feel good that we are helping out another institution and has given our IT folks a professional challenge. If a Pine Manor representative says, “I have a project with a quick turnaround,” how would the process work? Our CIO would sit down with the team designated to Pine Manor and plan out how and when the team would complete the project, whether it falls into the time parameters, and if additional people are needed. Share with us an example of a successful project. In 2013, we transitioned our admissions and development legacy systems to Salesforce. Our IT staff spent hundreds of hours writing workflows, creating reports and dashboards, and converting data. The conversion that took us more than two years was replicated at Pine Manor in three months, saving well over $100,000. Lasell also partners with other institutions on insurance programs. With these successful collaborations, what lessons have you learned? It takes time to get two institutions on the same page. Partnering is something different and new. You have to convince people that their world will not dramatically change and provide transparent communication before and after implementation. It is also important to have agreed-upon service level agreements that discuss response times, especially around IT collaborations. What should business officers consider in the contract negotiations of shared partnerships? Keep it simple. For example, on campus police, we share costs 50/50. When you start trying to create complicated formulas, you can get into trouble. You may also want to craft the agreement with the long-term potential for growth by adding more institutions. Of course, you need to add language about renewal dates and how an institution can extricate itself if the agreement isn’t working. Aren’t Mount Ida and Pine Manor colleges more or less your competitors? Yes. You hit the nail right on the head. They are. However, these types of functions, whether health insurance, IT, or campus police, don’t give our partner institutions a competitive advantage. Where we compete is on the quality of our academic programs. I really believe small- and medium-sized institutions need to work together if they want to be around in 15 or 20 years. We have so many private colleges here that are vital to the New England economy. By helping one another, we’re helping ourselves. As higher education gets more competitive, we have to realize that we can’t be an island. We have to build partnerships.